Yoga mats are a game changer when it comes to a sticky, sweaty yoga practice. Recently, I was far from my yoga home and decided to test out another hot studio. However, I did not have my favorite mat with me as I was out of town. I figured no big deal, I'll just rent one. The studio in and of itself was fabulous. It hit most of the checks on my "list" as to what makes a great hot space. But one major thing missed the mark: their rental yoga mats did NOT provide appropriate grip and safety. This completely changed my practice from stellar to super disappointing. I suppose I’ve been blessed to practice on great mats in my hot yoga practice, which has led me to take for granted the superior traction that’s necessary to have an out of body hot yoga experience. So when I tried practicing on a lesser quality mat, I was unbelievably distracted by the possibility of my downward dog being split in two from my slippery hands and feet! Let’s just say: that hot yoga experience was not my usual "you're Wonder Woman" experience. If you’re going to practice hot yoga, and feel like a superhero the entire time, invest in a yoga mat and/or towel that is intentionally designed to manage intense heat and sweat. Otherwise, you’re only cheating yourself because your practice will be so distracted from holding on for dear life, that you won't be enjoying the practice (which is clearly the point). A couple tips: Just because it has a famous brand name, doesn’t mean it’s the best for hot yoga. And resist the urge to buy a yoga mat from your local pharmacy, home goods store, or supermarket. So, what should you look for in a hot yoga mat? Consider the Thickness- The weight of your yoga mat has a lot to do with how comfortable it will be. Too thin and your knee may experience pain during low lunge; too thick, you may feel a weakened connection to the floor - making you more wobbly in balancing poses. Standard yoga mats are about ⅛ inch thick, which is a great option for hot yoga. If you know you have sensitive knees, go thicker so your yoga experience isn’t uncomfortable. If you’re always on the go, try a wafer-thin mat that you can fold up and fit in a suitcase. Go for the Grip- There’s nothing worse than slipping and sliding around on your yoga mat during an intense, hot class. This is the exact opposite of what the practice is supposed to be doing for you. We want to take ourselves out of the world of frustration and become one with the experience at hand, not over effort to stay in place. When you shop for your perfect mat, be sure to check the material. You're looking for a closed cell mat or one with a microfiber towel on the top and rubber base. This will keep you grounded while also absorbing your sweat. Make sure the mat description says it is used for 'hot yoga' and if it doesn't do the trick (after the break in period), return it or send it back. 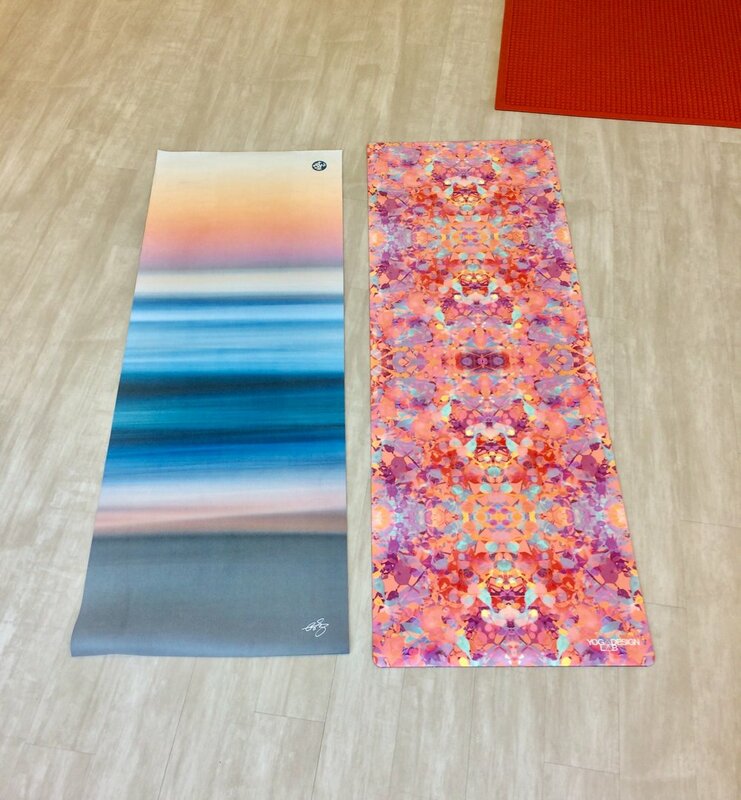 Don’t Skimp on the Cost- Though I’m all about saving money when possible, a high quality yoga mat is worth the splurge - especially when you’re committing to a consistent hot yoga practice. If you choose the cheapest option, it will not hold your dog and will quickly become a slip and slide. Keep the inexpensive mats for the traditional yoga room or your at home practice, not the hot space. In the hot space, it will absolutely deem useless as the minute you sweat, all grip is lost. Choose Support- At the end of the day, your yoga mat is your safety net and your right hand man. You carry it everywhere, it rides shotgun in your car, and you shed a lot of negative energy on it. It will always catch you when you fall (unless you bought it at CVS). Choose one wisely, one that supports you 100% through every down dog and every life changing experience. If you have any questions at all, let’s talk! Seriously, email me, call me, or stop into the studio. We sell some amazing sweaty yoga mat options at Yoga Fever that will 100% hold you in place. No, I’m not trying to sell you on a product. I’m simply trying to show you the stress-free, blissful hot yoga experience that comes with a great mat. Happy sweating!